What Causes a Deer Antler to Turn Black? Male deer begin growing their first set of antlers when they’re about a year old. Antlers are not only trophies for deer hunters, but they’re also researched by scientists. Antlers tell a deer’s story -- they can show his age as well as his heath. They can even show if he’s been shot in the past. Antlers are composed of calcium and phosphorus, and they’re a constantly growing bone. They're shed every year and grow anew. They grow from stalk-like structures called pedicels located on the frontal of the deer's skull. When a young buck is several months of age, small bumps can be seen on his head. These are the pedicels, and they react to the hormones in his body. While growing, the antlers are soft to the touch and full of blood and nerves. Growth typically begins in April, and by summer they are hardened bone. Antlers will darken from a chemical reaction between the deer’s blood and sap from trees. 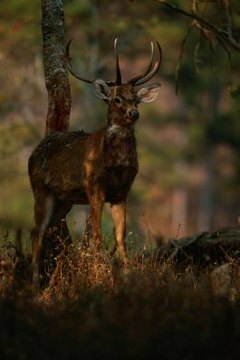 The velvet covering antlers is rich in blood, and when the velvet begins to shed, blood is left on the bone. If a buck rubs his head on a tree before the blood dries, it reacts with the sap causing a stain and darker color. The sap from pine trees is believed to cause the darkest stain. Since antlers are controlled by hormone levels, age may also play a factor in discoloration, and any damage to the pedicel causes deformity. Chronic wasting disease infects proteins in the brain, nervous system and blood. It's a neurological disease that's common as well as fatal to deer and elk. Since antler velvet is abundant with blood and nerves, scientists think it may be a source of the infection when it’s shed. Along with antler abnormalities, other signs of CWD include holding the head in a lowered position and extreme weight loss. A deer may be infected for months before showing signs. It’s recommended hunters wear gloves when fielding a carcass. Eating the brain, spinal cord or spleen should also be avoided. Antlers have one fastest new cell growths known to man. They compare to the cell growth of embryos and malignant tumors. When tissue from pedicels is surgical transplanted to another skeletal region, an antler growth forms. Scientists have grown antler formations on mice and other animals. It’s believed understanding antler growth will help human ailments such as arthritis, and potentially regenerate severed limbs. If a deer is shot in the hind leg and the bone is damaged, scientists are unclear as to why the antlers on the opposite side of his head grow shorter.